It’s no secret that math education in the United States has become embarassing. Among industrial nations, US students rank 23rd in science and 30th in mathematics. Even those numbers are deceptively high. If one considers the matter in terms of race and class and gender, the problem runs even deeper. Only 12% of black students and 17% of Hispanic students took algebra before high school, and as a matter of course only 9% of Hispanic students and 10% of black students go on to advanced algebra or calculus, compared to 22% of white students and 43% of Asian students. By now, if you’re a typical liberal arts snob, your eyes have glazed over. Numbers. More numbers. Whatever. And in a sense, you’re right. Those statistics are merely data. Like it or not, however, data and glut are here stay. It’s a civic duty to make sense of it. Sorting through data to determine what is relevant and not, important and not, sound or not might seem to many readers like “someone else’s problem,” à la the Hitchhiker’s Guide to the Galaxy but it is not. It is a prerequisite to being a citizen in a technological society. Mathematics holds one of the primary keys. One cannot make logical sense of newspapers, magazines or online reports, or even the fatuous Buzzfeed surveys and quizzes that bury Americans everyday in their minutiae, without some reasonable grasp of mathematics. Citizens need to be “literate” and able to make meaning out of words. They also need to be “numerate,” if you will, and able to make meaning out of numbers. That our culture has failed so badly at training its adults and children in math is not simply an educational failure. It is also an economic failure. More importantly, it is a political failure. Math has turned into an esoteric field of study, hated by Americans everywhere as a disciplinary tool to inflict upon them. It lacks meaning for most Americans, and moreso for children. Any parent trying to sort through the disastrous materials of “common core” has felt this frustration. That frustration is passed on to their children and the cycle continues. Imagine not talking with babies about anything until they learned the alphabet! This is what happens with math, when babies, toddlers and young kids only ever hear about small numbers and simple shapes. As parents, we are interested in creating rich, multi-sensory experiences for our children early on. We want to introduce them to the complex and exciting world around them. Yet when it comes to mathematics, we often do just the opposite – simplify, impoverish, limit. Doing this, we are not giving children a chance to observe, play with and ultimately learn math. Ms. McManaman and her collaborators came up with a different approach in their book, Moebius Noodles. At its heart is the idea that math is play and play is math. But this is not just a series of empty games. It is a legit attempt to encourage children to cultivate a mathematical state of mind. In our skills-obsessed education system this probably seems a heresy. Yet in the world of language it is simply taken for granted. Children create their own adventure scenarios everyday with toys, with paper, with computers, with nothing at all. This helps them learn language not by learning rules of syntax or morphology, but by connecting imagination with activity. Why not do so with mathematics? After all, math is present in every human being’s daily experience. Snowflakes are fractals and an invitation to explore symmetry and dynamic systems. Cookies offer combinatorics and calculus games. Paint chips come in beautiful gradients, and floor tiles form tessellations. The skyline of any city is a heaven of trigonometry. Even a simple game of rock, paper scissors is a practice of non-transitive properties. The real challenge of raising America’s proficiency in science, math and technology is to reconnect those studies to the ordinary lives of people. 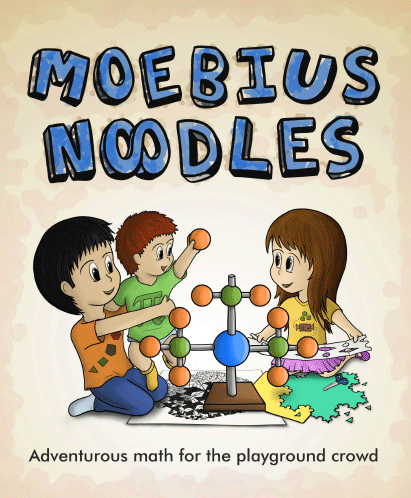 Moebius Noodles is a good step for children, from toddlers to “big kids”–and probably even better for parents, who may still harbor morbid fears of “math anxiety.” Along with the book, the authors have also their own online forum for parents and children that helps address their concerns and gives both new challenges as they move into (one hopes) a future where we can finally abolish innumeracy once and for all.